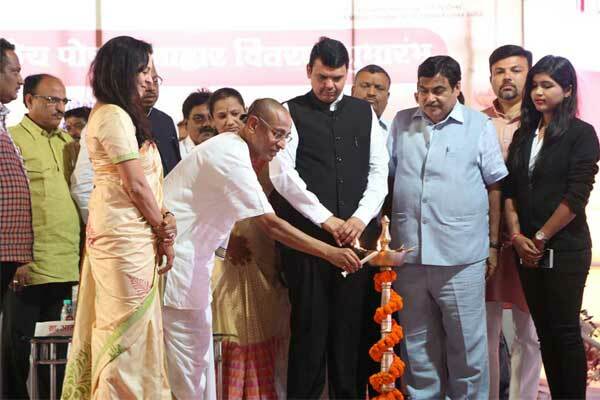 On August 19, 2016, Shri Devendra Fadnavis, Honourable Chief Minister of Maharashtra, inaugurated Akshaya Patra’s first centralised kitchen in Maharashtra at Nagpur. The event was presided by Shri Chanchalapathi Dasa, Vice Chairman, The Akshaya Patra Foundation and the kitchen, which has the capacity to serve 5,000 children, has been sponsored by Mr Ravi Tilak and Mrs Vandana Tilak. The event was graced by Shri Chandrashekhar Bawankule, Honourable Nagpur Guardian Minister; Shri Praveen Datke, Honourable Mayor of Nagpur; Shri Satish Vitthalrao Hole, Honourable Deputy Mayor of Nagpur; and Smt Vandana Tilak, Guardian Donor of Akshaya Patra, Nagpur. Shri Vyomapada Dasa, President - Akshaya Patra Nagpur, was also present during the event. The inauguration was followed by a symbolic serving of meals to the children and a flag-off ceremony of customised food distribution vans that will be used to deliver fresh, nutritious meals to the schools. With this new kitchen in Nagpur, our reach has expanded to 11 states in India with 13,210 schools benefitting from Akshaya Patra’s Mid-Day Meal Programme. The Foundation is thankful to the Government of Maharashtra for their support and encouragement. To view images of the event, click here.